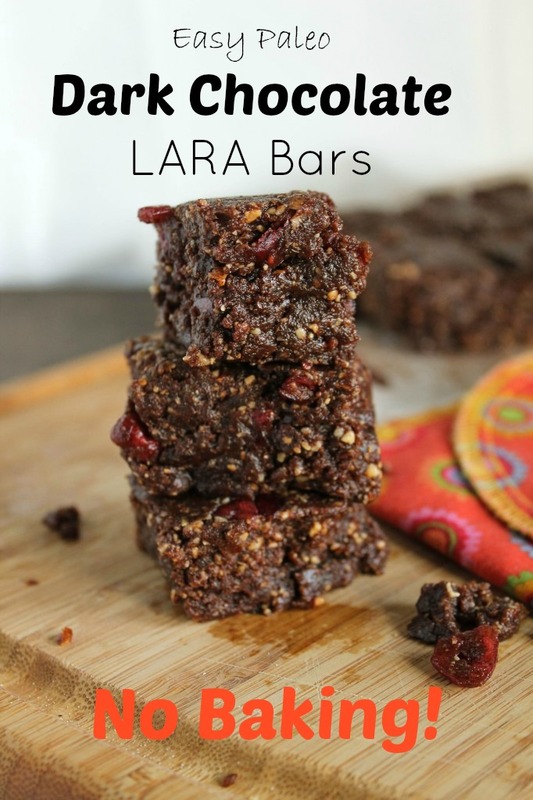 These homemade chocolate LARA bars make a great energizing snack for hikes or after sports! Paleo and Whole30 compliant, and quick and easy to make! I feel like we spend a FORTUNE on bars in this household. No I don’t just feel it, I know it! My middle child could sustain herself entirely on bars of almost any form. Around here, some of our favorites are KIND Bars and LARA Bars . But at $1.20-1.79 a pop, that is pretty pricey!!! So when I came upon a recipe to create our own protein dense bars, I just HAD to try it. I knew it would save me money, but unless it was delicious, who cares?! Well, not only are these a ‘knock out of the ball park’ fabulous, they are easy to make too! Why Should I Make My Own LARA Bars? I think two things really set these apart and take them WAY above and beyond LARA Bars: the toasted nuts and the dark chocolate flavor!! These are also much more moist than the original too. I wrap individual portions in waxed paper and store them in the freezer for a grab and go snack…not that they ever last long. My girls thought they were brownies….really! They do hint at dark chocolaty brownie goodness, so if you’re like my girls, you’ll think you’re having a dessert! If you like these no-bake power snacks, here are some others to try too! 15-20 large Medjool dates pitted, or about 8-9 oz. NOTE: don't use other date varieties...these are the Cadillacs of the date world, much softer and more caramel flavors than other varieties. Blend toasted pecans, sea salt, and cacao powder in a food processor (I ADORE mine, it has been a trusty companion in my kitchen for ages!!) until powdery and coarsely ground. Do not process so long that you have nut butter! Add in dates and process until blended into dry ingredients, this might take a minute! Pulse in the vanilla until well combined. Press mixture into an 8x8 inch dish. Freeze or refrigerate for 1 hour, or until firm, and then cut into 16 squares. Yummy! I love chocolate and cranberries together! Great snack! These look incredibly fudgy! I love making my own lara bars too because it’s pretty pricey to buy them, I only stock up when they’re on sale and I know we’ll be traveling! Yum! I love Lara bars and I love that you don’t have to bake these. So perfect for the summer when I hate turning on the oven. WOW — I cannot wait to make these! I am going to pin for sure ! NO BAKE treats that are good for you? Yes please! Thanks for this great recipe– sure to be fabulous!! What a brilliant idea for an after school snack too. Can so see my children enjoying this chocolate treat minus the artificial sugar treats. oooh, these sound so yummy and I love the caramel goodness of medjool dates too! There’s nothing better than homemade! 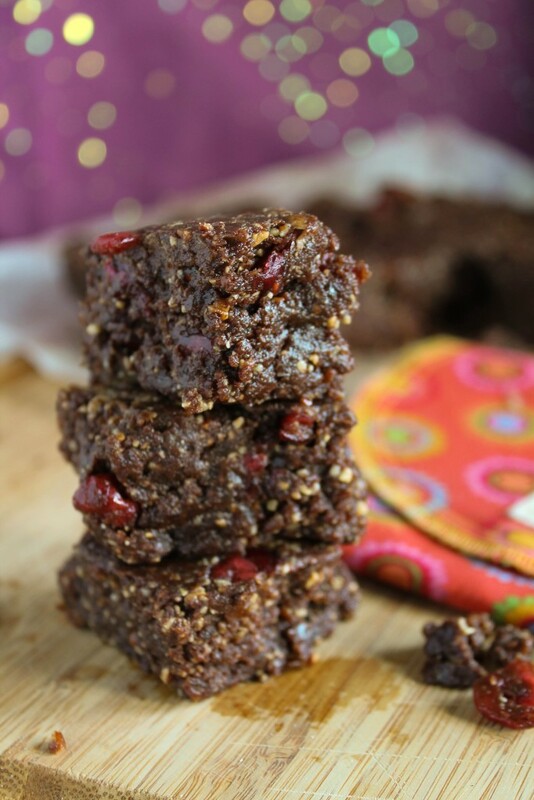 These look great with all of those yummy dates and cranberries mixed with chocolate. YUM! These are my very favorite!!! Dangerously good! Even better that the originals . I still love the apple pie, and the cashew cookie Larabar, but these ones don’t even compare to them. they ARE dangerous and WAY to easy to eat too many, I agree! Just wondering: do these need to be kept refrigerated? Would love to take them backpacking with me! You’re welcome Cassidy!! This is a long standing favorite in our household…and infinitely tastier than LARA Bars, which we enjoy too! I love larabars! 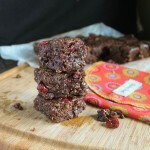 I make mine with sunflower seeds- I want to try this chocolate cranberry variety with sunflower seeds as the base! CONGRATULATIONS!!! Your recipe is on Today’s Feature Post from Cast Party Wednesday! Thank You for sharing your recipe with us! Tessa, these look fantastic and just the thing I’ve been looking to try. Thanks so much for linking up at Thriving on Thursdays! Oh my goodness Tessa, these snack bars are just amazing! Hope you are having a great week and thank you so much for sharing with Full Plate Thursday. wonderful! thanks for sharing with Kids in the Kitchen! pinned and tweeted! Thanks Steph, hope you get to try them…I make lots of converts with these babies!! Tessa, I truly have to stop visiting your site until AFTER I’ve eaten something!! I’m drooling over this recipe! The cranberries and chocolate grabbed my attention, and then the addition of coconut would be perfect for us. Thanks for sharing! LOL Mary!! Quite a compliment, I am glad things looks so tasty to you!! It just means you love food as much as I do, and probably most food bloggers out there! Tessa, thanks so much for sharing this wonderful recipe this week! I’m not a big fan of the commercial “bars” but I do occasionally make my own. Will have to try this recipe. Looks good. Thanks for sharing this recipe at Make-ahead monday! Hope to see you again next week! I am a fan of Lara bars because they don't have peanuts, sunflower seeds, rice, or soy (4 of my allergies/ sensitivities, and it's very hard to find a bar without at least one of these!) but don't usually buy them because of the price. I am so excited to try these!! Can't wait. yum, yum and double yum! i have to admit i was skeptical b/c I'm not a fan of Lara bars but these are awesome and way cheaper than store bought version! OK, maybe not, but I am NOT a stickler for looks when it comes to food and I always like minimizing the dishes, I HATE doing dishes! Let me know how they turn out, I had several adults try it and they were wowed! I have a problem with only one thing….I KNOW you are not lazy!!! I am excited to try this Tessa….thanks!